Futron Inc., a government solutions provider based in Northern Virginia, focuses on three primary core business units that are supported across the US and globally. TRUE creative services translated the company brand into related sister brochures for their various core services. Shown here, 2 of the series of 5 brochures. The first piece created was a much-needed corporate brochure which powerfully and creatively conveyed their brand identity and mission statement which would then be translated to all future marketing materials. 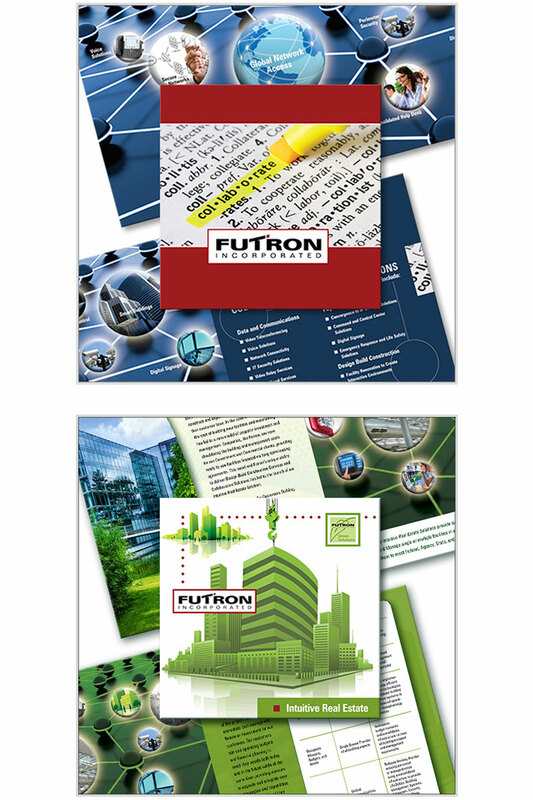 The second piece shown visually illustrates Futron’s Intuitive Real Estate Solutions which provide their customers with the unique ability to Design, Build, and Manage single or multiple facilities in an economical fashion while simultaneously allowing them to meet Federal, Agency, State, and Local environmentally friendly standards.